We’d love your help. Let us know what’s wrong with this preview of Allies & Enemies by Cheryl S. Mackey. A spy who betrayed his tribe. Ivo, Jaeger, Jadeth, and Emaranthe must locate a lost city. To find it they need a map held by their enemy. 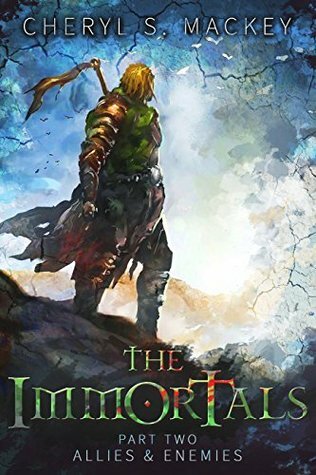 When they are joined by a spy seeking redemption, and a mortal seeking his destiny, the quest becomes one of life and death, love and loss, decei A mortal who believes in a different god. Ivo, Jaeger, Jadeth, and Emaranthe must locate a lost city. To find it they need a map held by their enemy. When they are joined by a spy seeking redemption, and a mortal seeking his destiny, the quest becomes one of life and death, love and loss, deceit and hope. Will they find the map in time? Or will they discover enemies among allies? To ask other readers questions about Allies & Enemies, please sign up. I read this young adult novel and give it five plus stars. I pre ordered the book based on the sample at the end of book one. I couldn't wait to read it and I was not disappointed. In fact, I read this romantic action packed tale in one night and with blurry eyes I rushed to review it, so others can enjoy it too. As I have said before, this author is a very vivid story teller. Every page drips with action and mystery. Her use of flashbacks and inference make for an intriguing sophisticated story that is interesting to all ages on many levels. As the saga continues the heroes must get a map to find a forgotten city and save the world. What’s not to love about a quest with lots of action and even romance? The characters are complex and real which is so enjoyable. The romance is not sappy, or unrealistic. The strong women and the respectable men and the theme of working together to solve problem an excellent choice for a young reader. Ermanthe the fiery girl with abilities to help light the world and the hunky Earthlanders along with a lithe elf healer make a formidable force as they travel to find this map that so many want. Good people and bad people are all after this map and infamous city. The heroes meet old friends, lovers and make new one in this journey through the desert but who to trust, who to love and who to kill? Are the questions they must solve while battling to gain control of everything including their pasts. The demons they battle are internal as well as external which makes for very complex characters that this reader wants to continue learning about. I really enjoyed this prequel. It's part two of a two part prequel series by Cheryl S. Mackey. It is better than the first half because in my opinion, based on the fact that it made me feel more emotions and it made me go and buy the The Unknown Sun which is the first in the series these were prequel to. And if you read my review for the first one you will see I wrote that this would make an awesome action movie.